Gate Snapper does not differ from other undesirable applications, so if it ever happens that you detect this software on your system, you should hurry to delete it because it will just provide you with a bunch of commercial advertisements. If you do not want to see these third-party ads every time you surf the web, you have to delete Gate Snapper from your system as soon as possible. Even though the removal of this program is not difficult at all, we understand that not everyone is experienced in malware removal, so we will help you to eliminate the unwanted program. This advertising-supported application is published by Super Web LLC, and it does not differ from Score Escape, Deja Data, Cling-Clang, Gooternet, and other similar unwanted programs. It means that it will also show in-text, interstitial, search-related, and other types of advertisements on your screen. These might ruin your browsing session, so you should stop them from appearing as soon as possible. The only way to do that is to delete Gate Snapper. If you do that, it will not be able to do other suspicious activities behind your back as well. Therefore, our security experts believe that you should to delete this adware program. Unfortunately, advertising-supported applications are very prevalent, so you should take care of your computer’s security in advance. The security experts at pcthreat.com recommend that you install an antimalware tool and keep it enabled. It is very important to choose a trustworthy application in order to block the way for malicious software. We recommend using SpyHunter because we know that it can prevent adware and such serious infections as ransomware, Trojans, and rootkits from entering the system. Of course, you can use different software as well; however, you should not forget to check whether it is completely reliable. 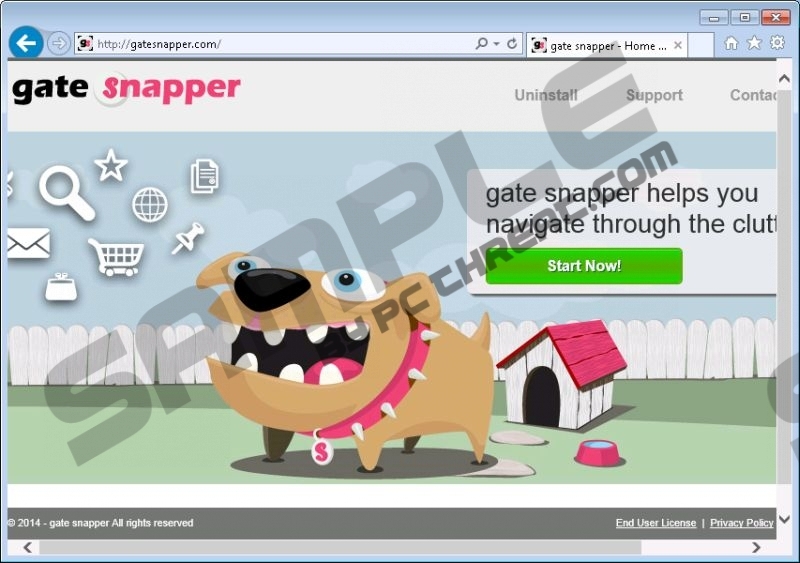 We have prepared the instructions and placed them below this article to help you delete Gate Snapper from the system. The program can be deleted via Control Panel; however, if you do not have much knowledge about computers, you might find the manual removal process difficult. Keep in mind that you can invest money in an antimalware tool, such as SpyHunter, and then scan the system in order to eliminate all the infections, including Gate Snapper, from your computer. If you buy the license for the aforementioned tool, it will protect your system from future threats as well. Select the suspicious software and click Uninstall to eliminate it. Quick & tested solution for Gate Snapper removal.